Workers hang green glazed terra cotta panels on the new Helga Wall-Apelt Center for Asian Art at the Ringling Museum of Art. 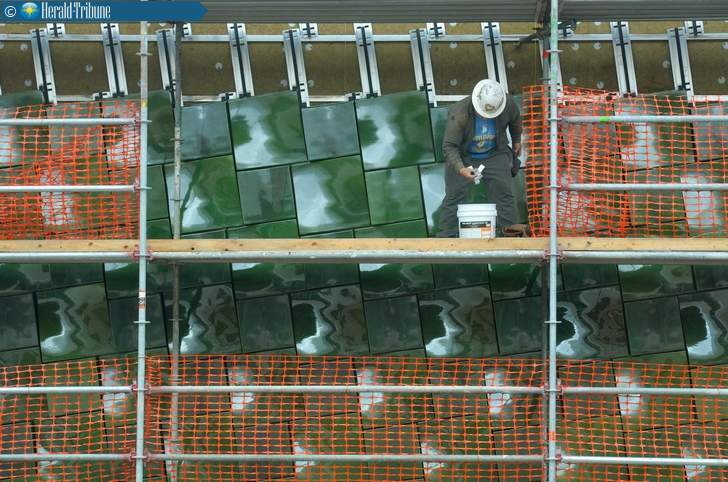 Three thousand handcrafted terra cotta tiles, glazed an iridescent green, are being painstakingly installed on the exterior of the future Helga Wall-Apelt Center for Asian Art on the campus of the Ringling Museum. The tiles, made one at a time at Boston Valley Terra Cotta in Orchard Park, New York, weigh 60 to 70 pounds apiece, and are installed on a stainless-steel track and clip system. The tiles, squares and rectangles with a concave surface, are being installed on a slight angle, and fit together almost like scales on a dragon. Steven High, the museum’s executive director, made two trips to Boston Valley Terra Cotta to see the manufacturing process. “Each one is hand touched probably four or five times during the making process,” High said of the tiles. The tiles are being trucked from the factory to the Ringling as work on the Asian center proceeds. The Asian center is being built on the southwest corner of the museum and is directly across from the museum’s education and administration building, giving High and curators of Asian art Fan Zhang and Benita Stambler front-row seats for the project. The tiles have covered about half of the center’s south facade. When completed, the Asian center will have nearly 20,000 square feet of gallery space, a lecture hall, storage and study area and a pavilion. The glaze involves layers of green fired atop layers of gold and took six months of “sampling and sampling and sampling,” Pottle said. Because the tiles are concave and fired while lying on their backs, the glaze pools in the concavities. Hanging the tiles is an exercise in precision, as the tiles must meet at a 45-degree angle at the corners of the building and also accommodate parallelogram-shaped windows. Museum deputy director Grady Enlow said the construction crew spent the first week looking at the wall, the supports and the tiles before actually beginning the installation process. There’s been little breakage so far; Pottle said the job involves about a 1 percent allowance for damage. Boston Valley will keep some tiles in New York and the museum will keep a few on hand in case of storm damage; any tile can be removed and replaced. Boston Valley is just one of two companies in the world capable of handling a project of this size, High said. The company also has done extensive renovations to the terra cotta of the Cà d’Zan mansion over the years. Construction on the $10 million center should be complete by next summer, with an official opening in February 2016. The building is named for former board member Helga Wall-Apelt, who is in litigation with the museum over delays in building the center. Wall-Apelt filed suit last spring against the museum, Florida State University, which owns the museum, and the FSU Foundation, claiming the entities have failed to comply with terms of a 2006 gift agreement in which Wall-Apelt pledged her $30 million Asian art collection, millions of additional dollars in support and the remainder of her estate to the Ringling, with the collection to be housed in the new wing. Her art collection has since been returned to her. High said the case is in the deposition phase with no court date set.